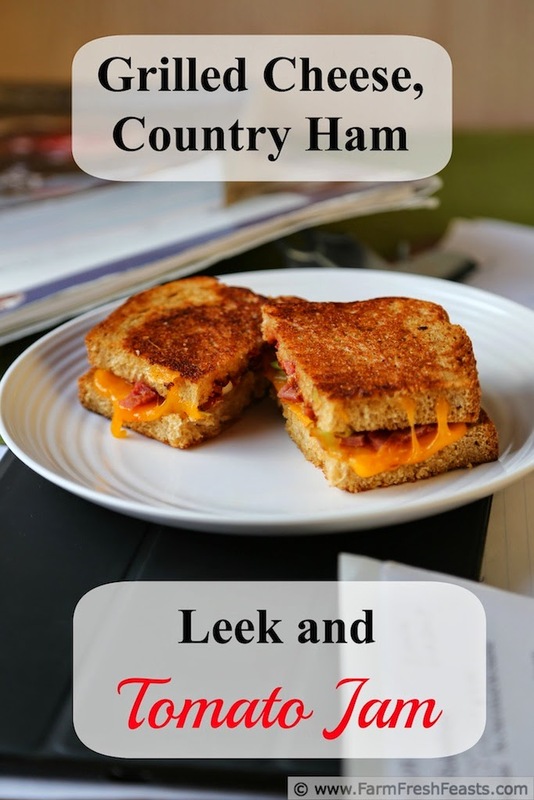 Sweet and salty, tangy and gooey, this grilled cheese sandwich with country ham, leeks, and tomato jam hits all the right notes. You ever make a large quantity of a condiment, and then not know what to do with it? Yeah, that happened to me, too. I had so many tomatoes that after putting up crushed tomatoes, seasoned and plain tomato sauce, green tomato bacon jam and salsa . . . whew . . . I decided to try making tomato jam. I got the idea, and the recipe, from Marisa's first cookbook, Food In Jars (link to her eponymous website--hey, did I use that word correctly? Do I get points?). Tomato jam sounded like something I ought to try, and since I'd nearly filled up my pantry with other tomato products I gave it a go. It was easy because Marisa's directions are clear and simple to understand, she anticipates my questions and answers them before I think to say 'but, what about . . .'. I got her book out of my local library. In a ham sandwich, this tomato jam just sings. The sweetness of the jam perfectly balances the saltiness of a slice of ham, and you bet I'll be blowing through a jar eating Easter ham leftovers*. But tomato jam with a chicken sandwich? It's not that terrific. Turkey? Um, no thanks. I needed to get creative. 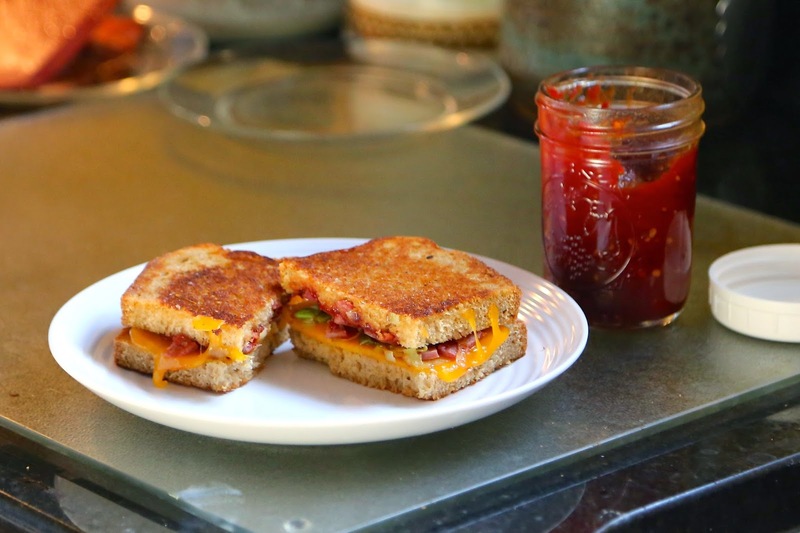 After I used country ham and leeks on a pizza, with asparagus and egg, I was inspired to try that combination of country ham and leeks in a grilled cheese sandwich with tomato jam. Bingo! 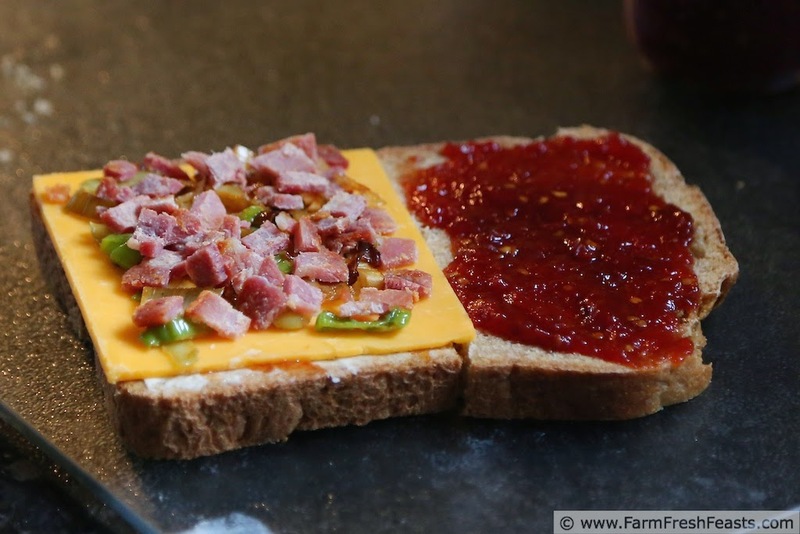 The combination of salty bits of country ham [I like to bite my sandwich neatly, and not have the entire piece of meat pull out from between the bread, so I diced it] and sweet and tangy tomato jam is excellent. Add leeks, cheddar, and a griddle and you're golden. Serve it alongside creamy tomato soup and you'll have such a sense of accomplishment, a la The Little Red Hen (and no shortage of folks to help you eat it!) --Amazon affiliate link if you're not familiar with the book. For more recipes using leeks, please see my Recipes Using Leeks Collection. For more recipes for what to do with a glut of tomatoes, please see my Red and Yellow Tomato Recipes Collection. Yes, there is a Green Tomato Recipes Collection. All of these collections are part of the Visual Recipe Index by Ingredient, a resource for folks like me eating from the farm share, the farmer's market, the garden, the neighbor's garden, and great deals on ugly produce at the grocery store. Preheat a medium sized skillet over medium heat. Add a teaspoon of buttery spread (you'll use the rest on the bread) and sauté the leeks for 3-5 minutes until browned and softened. Set leeks aside. 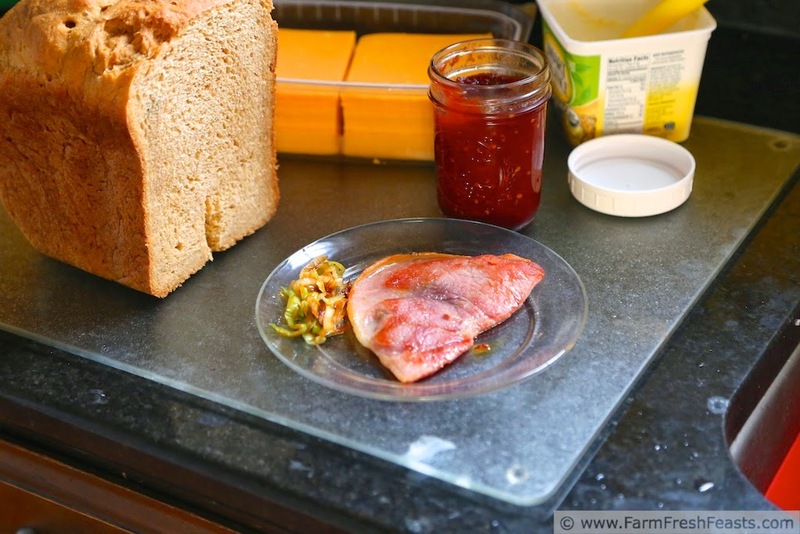 Add the half slice of country ham to the hot skillet and brown both sides, 2-3 minutes per side. Set aside and chop into bits when cool. Spread 2 slices of bread with buttery spread and put them--butter side down--in hot skillet. Top one slice with cheese, leeks, and ham. Spread the other slice with tomato jam. Brown the buttered sides of bread in the skillet, about 3 minutes, then layer the slice with tomato jam on top of the ham and leeks--jam side down. *While in Chicago last week I had a Pub Waffle for breakfast with tomato jam on the side. When I get that recipe recreated here, I'll share it. Over the weekend it was my daughter's birthday, and she wanted "pancakes, bacon, and chocolate" so I made her chocolate chip bacon pancakes for breakfast. Yum! Then I got a good deal on uncooked corn tortillas and made eggs and beans and sausage and peppers for Sunday's breakfast. Since we do big breakfasts on the weekends, it will be a little while until I get that recipe up. I need some Easter ham first, as I think ham would be better than the turkey slice served to me on the Pub Waffle. Kirsten, this flavor combination sounds amazing--especially the salty with gooey cheese. I've never had tomato jam before but I bet it is divine on this! Thank you so much. 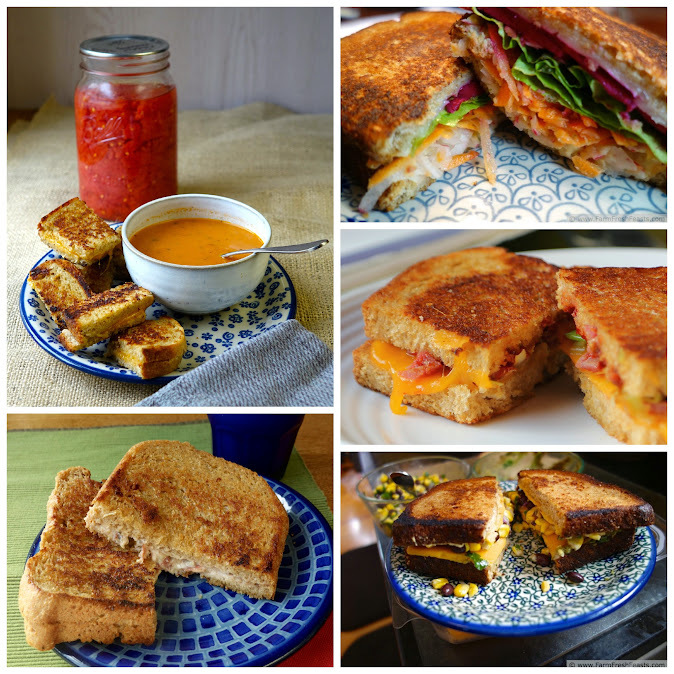 I'm such a fan of grilled cheese--it's perfect for an easy supper, a quick lunch, you name it. Tomato jam should be tried--I'm looking forward to seeing what Marisa has cooked up in her new book, Preserving by the Pint. I'm loving the flavors in this sandwich! Yum! Thanks--this combination totally works for us. I'm looking forward to some tomato jam and Easter ham combinations, too. Ahhhhhhhhh! I LOVE Grilled Cheese and I LOVE LOVE LOVE Marisa! I just finished reading her new book - Preserving by the Pint - and I'm so stoked to make EVERYTHING in it! Also - love the use of leeks and tomato jam in yours. Excellent sandwich, m'love. PS. Where's your chocolate milk? I need chocolate milk for my grilled cheese. Chocolate milk and grilled cheese? I'll have to try this out. For me it's grilled cheese and creamy tomato soup--usually with tea--but if you say chocolate milk rocks, then I'll try it. Even though I had an incredible cheese packed dinner tonight, I'm salivating over this sandwich. Actually the ham was the one thing missing in my tonight for obvious reasons. I love the combination of the leeks and the tomato jam with the cheese. This is another winner. Cheese-packed dinners sound wonderful to me. What time shall I arrive? 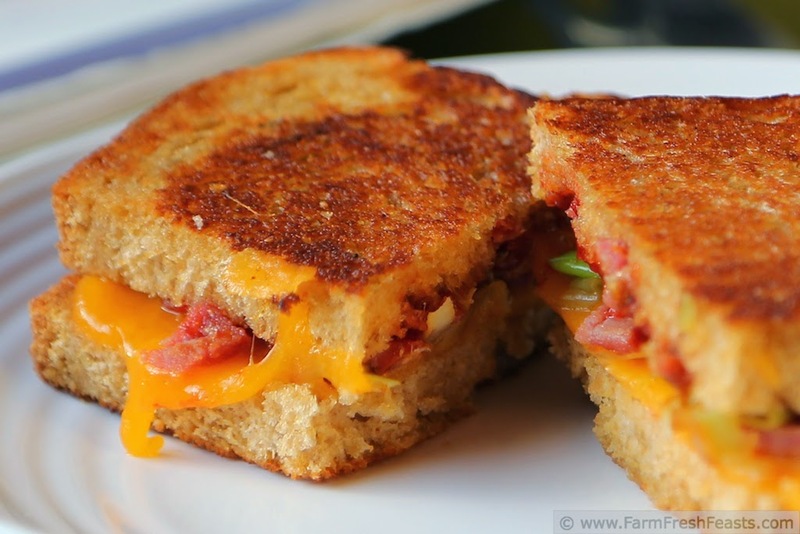 I am featuring this tomorrow on my Tasty Tuesday blog hop. I'd love if you'd stop by and link up again. Make sure you grab a featured button! Sure, why not? Just remember to change the name.